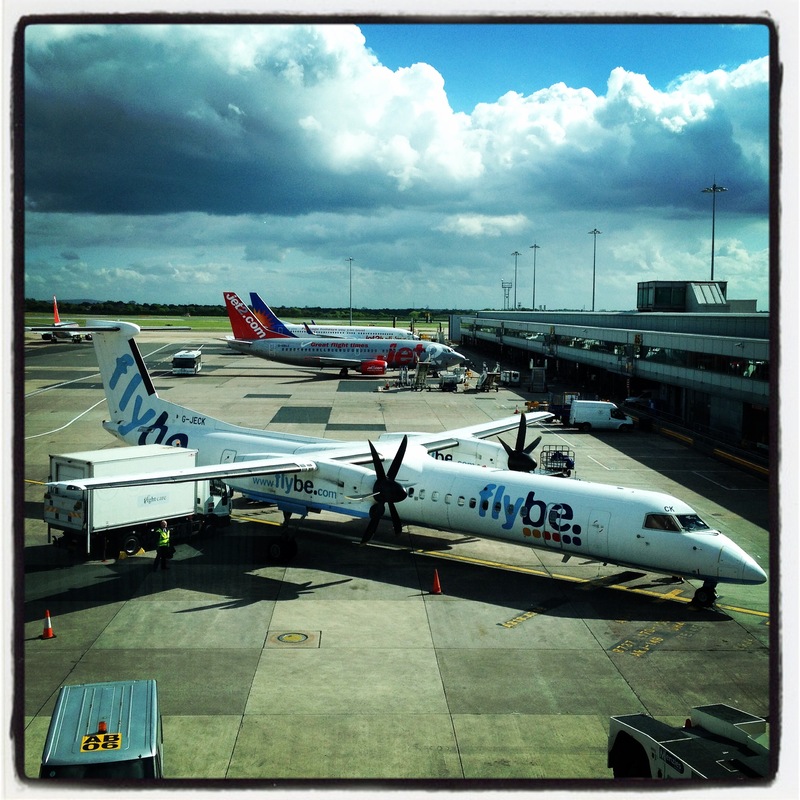 As regular readers of this blog will have spotted, I fly quite a bit with work. So I’m pretty used to the circus of zapping, fondling and rummaging that is airport security. I’ve got a system now. I have all my stuff ready to go so I can breeze past people fumbling with belts, tiny plastic bottles of goop and arguing about whether a Kindle counts as a laptop. I know which items of clothing not to wear, because the metal in the buttons makes the Archway Of Truth go ping as you walk through. This is worth avoiding if possible – it means a designated Security Wizard will subsequently wave his Wand Of Bleepy Investigation over you and you’ll end up having to take off your shoes (which is annoying in a range of ways). Sometimes I get extra-unlucky and have to enter the Chamber Of Nuclear Surrender – where you stick your hands up and brace for a good, hard blasting of radiation. Faceless Security Wizards in some other dimension will then scrutinise your unmentionables on their Screens Of Ultimate Intrusion. On the plus side, some airports still do manual frisking, which is nice, because if you think about it, it’s kind of a free massage. Recently, as I was restoring my dignity item-by-item after going through security (shoes first, then belt, then wallet, etc), I overhead a lady challenging the Security Wizards on the necessity of all this. “It’s for your own good, madam,” said the Wizard. This is not a phrase I associate with happy times. ‘It’s for your own good’ was the catch-all excuse for many of my unpleasant childhood experiences. Injections at the doctor’s, studying for exams, not being allowed to ride my bike along a six-foot-high fence – these things were all, apparently, ‘for my own good’. 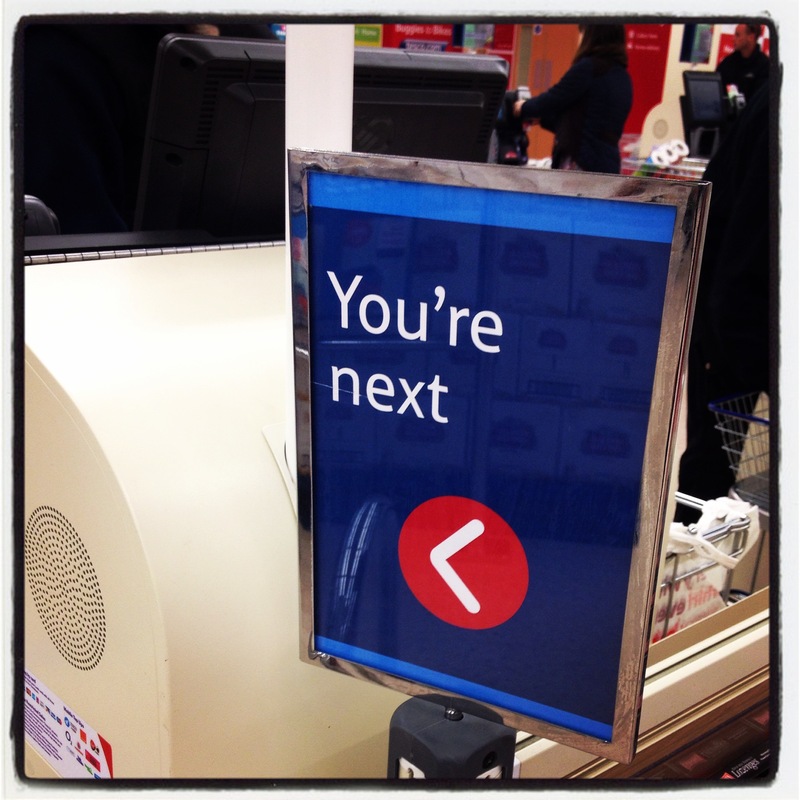 Tesco also have a slightly threatening approach to queue control.  So it’s with this natural suspicion of anything that’s ‘for my own good’ that I greet verses like Romans 8:28, where Paul wrote in the Bible that God works through ‘all things’ for the good of those who love him. Often, when we think about this, we think of God like a kind of cosmic handyman, doing the best He can with the materials He’s got. With the cards He’s been dealt. And while God probably likes the humble image of the tradesman, and the honorable estate of rolling up one’s sleeves for hard work, this is not accurate. In fact, God is more like a chess Grand Master, where every move by everybody else will end up delivering His Master Plan, irrespective of their intent. We do indeed have the freedom to play any move, but His ultimate aims – for our good – will be met. It can be difficult to buy this when we are immersed in suffering. One of the reasons for this is that the Enemy has great PR. Evil is very good at looking like it’s winning. It has some fantastically impactive imagery and plays on our natural, biological tendencies for fear and self-preservation. Good is much harder to see around us. It requires effort to see it, because good is mostly quiet and often hidden. We don’t gossip about it. It’s not selling newspapers and filling 24-hour news channels every day like bad things – all the aircraft crashes, international crises and plagues that didn’t happen through good work don’t get reported.You don’t notice all the things you do have as much as the absence of the things you don’t. We’re not wired for as strong an emotional response to good as we are to evil. In this video, the opening scene of Saving Private Ryan, Tom Hanks plays the lead character, storming the beaches at Normandy in World War II. He looks around at the horror and chaos, apparently overwhelmed for a moment. He has a choice – he can be consumed by it, or he can hatch and execute a plan to get through it. The hard truth about suffering is that, like Tom Hanks’ character, we have a choice. We can see any one thing that happens as a threat or an opportunity, no matter how small or great. We get to choose how we see it and how we respond. We can see it as a threat, and fear the loss or pain that it will cause. Or we can see it as an opportunity to further the agenda of Good. The challenge, as Christians, is not to think of suffering as singular events that happen to us. Instead it’s to accept suffering wholesale as part of our lives and weave our experiences of it into the patchwork of our life-story; to allow these experiences to become part of us and who we are. We do that by seeing – and taking – the opportunities for doing good that they present. That’s how we conquer evil. If you can train yourself to do it, you become unimaginably powerful. Dr Kate Granger is a 32-year old medical doctor from Yorkshire. Kate’s career, hopes and dreams were challenged when she became terminally ill with an aggressive sarcoma. Kate’s response has been to use this an opportunity to drive forward improvements in how doctors relate to patients. She’s having an amazing impact, using her situation to change healthcare. Resist the urge to compliment her on how inspirational she is and then forget about it – Kate is role-modelling how we must all greet all suffering. Kate isn’t the “oh, isn’t that nice?” story. She’s the challenge, to you, to live like her. After combat, military veterans wear ribbons on their uniforms to show where they have been and what they did. For Christians, scars – whether emotional or physical – should be worn in the same way. Jesus kept his scars (Luke 24:40). For us, they are a reminder of the victories that we won by taking evil events, and outweighing them with the good we bring out of them. In suffering there are so many opportunities if we are willing to see them – and it’s not always about us. We have to be willing to look in the open spaces, and be patient in the wilderness. It’s not always easy, but it’s always faith. “‘It’s for your own good’ was the catch-all excuse for many of my unpleasant childhood experiences.” And one which seems to carry it’s own reward for grimacing and moving one. Just like “it’s an acquired taste” (as someone pointed out) is a sign we rewards ourselves with for being grown-up. Ponder-full post, thank you. Suffer, reward, suffer, reward. The spreadsheet of how to get to heaven is never far away.